Making use of social media carries risks, but there’s possibly more risk in NOT participating than in participating. The video below shows five top tips for using social media by Sarah Leech, head of digital engagement at HOME (previously Cornerhouse) in Manchester. Social media has profoundly shaped the world over the last 15 years or so. Social media is characterised by being participatory, open, user-friendly, and, well, social. 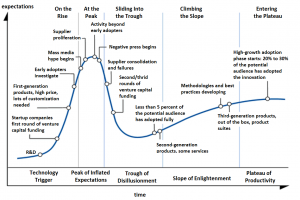 The story of ‘the rise of social media’ includes the emergence of Blogs, Wikipedia, Youtube, Facebook, Twitter, and thousands of other sites and services – all of which have put potentially mass communication tools into the hands of the individual, rather than being the sole preserve of the professional media outlet. Social media is neither ‘good’ nor ‘bad’. There is a spectrum of attitudes towards social media – from sceptical to nervous to near-evangelical. The resources on these pages will document both challenges and successes, and both the positive and negative aspects of social media. However, they will aim to be as practical as possible – and are aimed at community radio stations, who (usually!) have very few resources to spend on posting to social media, let alone developing a social media strategy. Social media is becoming increasingly ubiquitous – according to the GlobalWeb Index, 85% of internet users in the UK had a social media account in 2014. 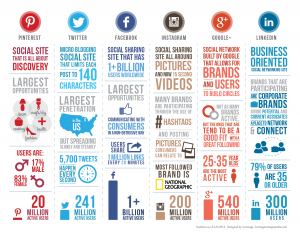 Of the various social media platforms, the table below shows that Facebook was the most popular. Our use of social media is also increasingly linked with our use of smartphones. Ofcom’s Communications Market Report 2015 states that the UK is now a “smartphone society”: two thirds of people in the UK now own a smartphone, and people are using their smartphones for nearly two hours every day to browse the internet, access social media, shop and bank online, and that “33% of internet users see their smartphone as the most important device for going online”. Given the proliferation of social media sites, we couldn’t cover them all in this guide – nor would we want to! So, below is a list of some of the major social media sites, and a brief overview of how each site works. We’ll also try to give pointers to other sites similar to those we list here. 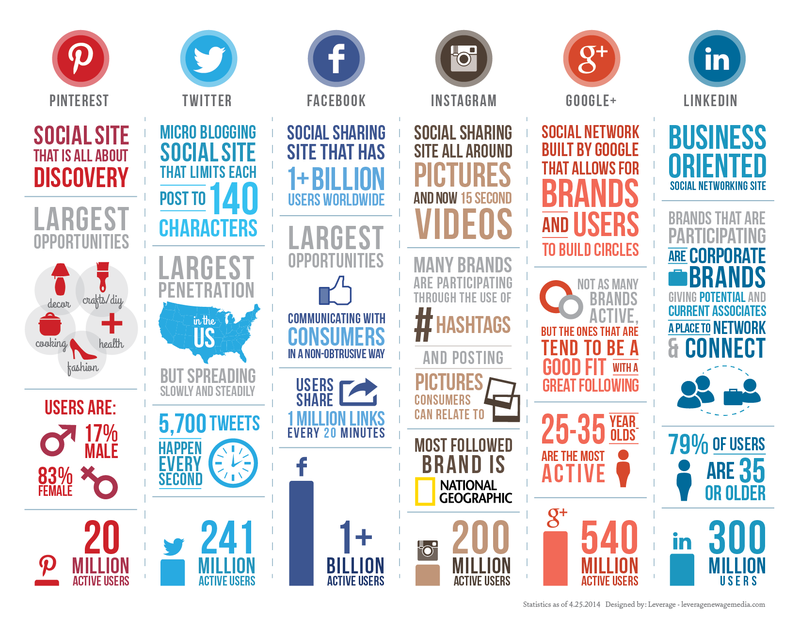 The i nfographic below (source) shows some highlights of what each site is useful for – or see this infographic on the evolution of social media 2008-2013. Group – this is for people who are interested in a particular thing. Only personal profiles can join a group (i.e. page profiles cannot join a group). Your station could find some use for creating a Facebook group but it should not be your main profile (this should be a page), as they can be cluttered and you won’t have full control over it, furthermore many of your station’s listeners could be put off as they may not want to be active in conversations or have their personal profile visible. Friends need to be mutual – you send a person a ‘friend request’ and they either accept or ignore this request. Anyone can like a page. Groups can be open or closed. People engage with Facebook content through liking, sharing, and commenting on stories in their ‘newsfeeds’–These features also allow you to measure engagement on your own posts. Longer posts are permitted on Facebook than on Twitter, where posts are restricted to 140 characters. The current Facebook post limit, by contrast, is 63, 206 characters. Facebook’s near-ubiquity makes it a potentially powerful medium for engaging people around your work. This will vary by age range and other demographics, so it’s worth thinking about how you are targeting and engaging different age groups, communities, etc. However, not everyone will actually see what you post, and whether they do or not is hard to manipulate (partly because Facebook makes ongoing changes to how this works). Facebook is heavily oriented around its advertising model, which influences what posts people see and from whom. Illustrating this, there was an interesting experiment where someone ‘liked’ everything in his Facebook feed for 2 days – but ended up not actually liking anything in his feed, as it became dominated by brands. The lesson to be learned here, then, is that Facebook gives prominence to organisations that pay, and therefore paying Facebook (i.e. taking out advertising) will increase the reach of your posts. Facebook has launched a site specifically for non-profit organisations, with tools and tips for how to make best use. Twitter is more ‘open’ than Facebook – you see everything tweeted by the people and organisations that you’re following, with no filter. Posts are limited to 140 characters – these are broadcast to your followers and visible to anyone (unless your account is protected). Hashtags are another key feature of Twitter. These were developed on Twitter (though they have subsequently been used on other social media sites) as a way of labelling posts to help you find what people are saying about a certain topic, or to participate in events. 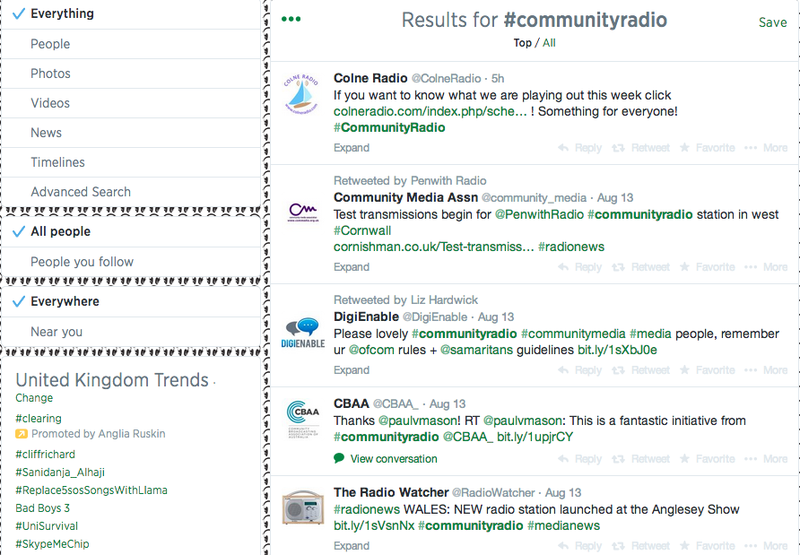 The screenshot below shows a Twitter search for the hashtag ‘#communityradio’ (it would also be worth searching for ‘community radio’ which will pick up all mentions of community radio, not just the use of a specific hashtag). Hashtags can be a way of focusing attention on a cause or campaign (e.g. Radio Reverb created the #Reverbathon hashtag for their fundraiser), or for keeping up with an event that you can’t physically attend, but they’re also often used jokingly to indicate that the tweet is not in all seriousness. Another feature of Twitter is to follow Twitter lists – or create new Twitter lists of your own, e.g. of people/organisations in your local area, or of people who are talking about a particular topic/area of interest, or simply accounts that you particularly like to follow. 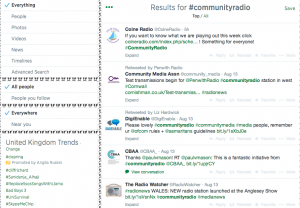 This can be used as a way of managing your time spent monitoring Twitter, focusing your attention at particular times on specific people or organisations – for example your station’s presenters, or local businesses, or other community radio stations. See the video below on how to set up and use Twitter lists strategically for your station. LinkedIn is geared towards professional networking – making links and connections with people you have worked with, or would like to work with, or who share a particular professional interest. LinkedIn can be a very useful tool to make strategic links with others, which can grease the wheels of, say, a partnership development or a funding application. It can also be used to consolidate links made at meetings, and offer each party an opportunity to find out about the other’s experience and interests. Instagram and Pinterest are both photo-sharing applications/services. Some features of each are given below, followed by a brief comparison. Photos can be linked to the source, making it a great tool for driving traffic to your website. Pinterest and Instagram are used by organisations to engage people in quite different ways to Facebook and Twitter. Functionality is much more reduced on these sites than the more mainstream social networks – and are therefore used in specific ways, or to reach specific audiences. For example, if you want to engage a younger, more tech-savvy audience, you might consider using Instagram. If you want to engage a female audience, Pinterest might be more appropriate. You might also want to consider sharing a particular type of photo with one, or both, of the sites – e.g. presenters or trainees having fun, or even ‘arty’ shots of the studio! WordPress : last but certainly not least, a social media platform over which you have complete control. 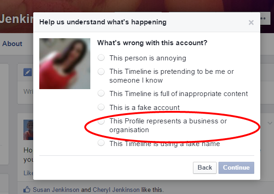 (What would happen if Facebook were to dramatically change its terms, etc?) Your blog should be on your station’s website – not just a free WordPress site separate from your station’s site. It’s important to familiarise yourself with the tools and functionality of each site. A silly example, perhaps, but know the difference between the ‘search’ and the ‘post update’ boxes – something that Ed Balls mixed up in a now infamous tweet. Various social media sites are tipped as ‘game-changers’ when they start off – but not all sites actually meet their early evangelists’ predictions. 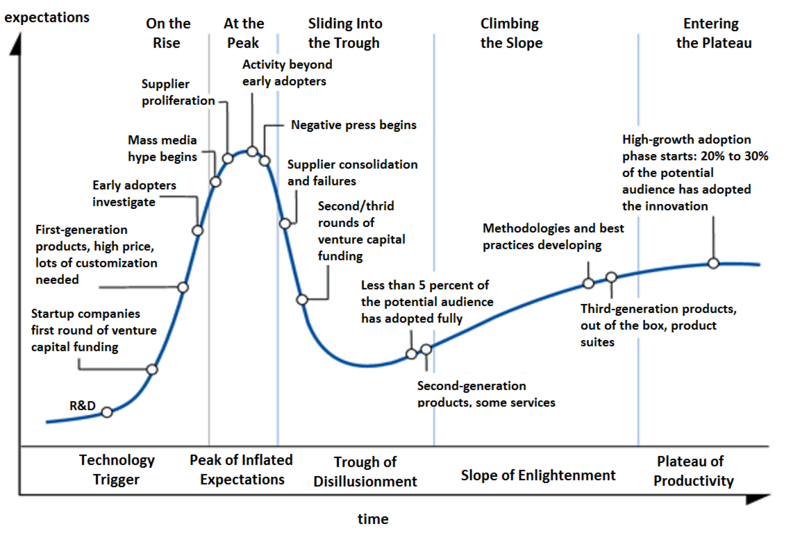 There will continue to emerge new social media sites, which are often initially hyped and then die off – see the social media hype cycle reproduced below. It’s never possible to exactly predict which sites will endure, and thus which are worth investing time and resources in. If you are actively interested in keeping up with social media developments, it’s never harmful to try out new sites (perhaps in a personal capacity) – or you can choose to wait until the hype around a particular site reaches a critical point and you deem it worthwhile to give the new site a go. The bottom line, though, is to assess whether using a new social media site will help you achieve what you want to achieve. Who is your Twitter feed engaging with? Are you talking to the people you want to be talking to? The guide on engagement has some examples of how stations build connection with their communities. 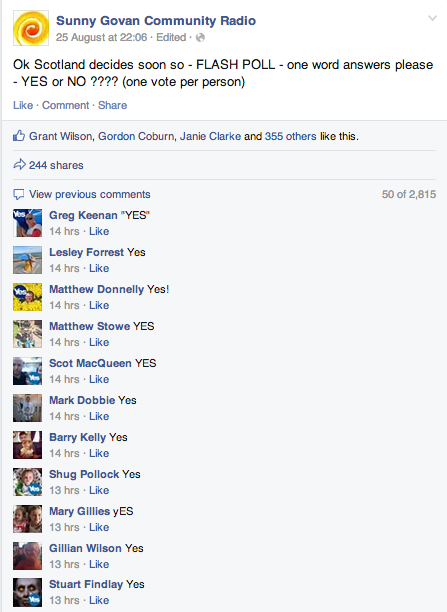 Another example, in the pic above, shows a quick poll on Facebook by Sunny Govan about people’s voting intentions in the Scottish Independence referendum, which garnered over 2,800 comments within two days. Social media gives you an opportunity to present your organisation in a variety of ways, and to engage interactively with your audience, partners and local businesses. There are a lot of social media sites out there, and more sites will continue to be developed over time. Some sites are more suited to particular types of content, or to particular audiences – before you decide what to use or sign up for as an organisation, it’s best to think strategically about what your organisation wants out of social media.